The Sight and Hearing Association of Minnesota has found that hearing loss can occur from chronic overexposure to loud noise. Noise fatigue is a workplace hazard for many occupations, including farming. According to several university studies and research compiled by the U.S. Center for Disease Control and Prevention, up to 75% of all farmers experience some form of work-related noise fatigue and hearing loss. Although mining comes in at number one, farming would be towards the top of the list when it comes to occupations that have a high risk of causing hearing loss. Tinnitus, commonly described as ringing in the ear. Hearing loss is often progressive. This means that farmers exposed to persistent, intense noise could feel the affected of damage later in life. For example, despite upgrading to noise reducing machinery such as cab tractors, hearing loss could still occur due to past exposure. Unfortunately, many farmers feel that the only loud noises they come in to contact with are from the tractors. This is not the case; throughout the day, a farmer is exposed to a variety of noises that could lead to damage. How loud is too loud? A general rule of thumb is that if you have to raise your voice over the noise of a machine to talk to someone who is just a few feet away, then the machine noise could be at a damaging level. The accepted level of work related noise is 85 decibels; anything louder than this and protective gear should be used to prevent hearing damage. Clearly, there isn’t a lot going on during the course of an average workday on the farm that wouldn’t require the need for noise protection. There are many types of protective gear available on the market including noise reduction headphones to ear buds; even small earplugs will provide some level of noise dampening. In order to follow through on using them when needed, the best choice is something you feel comfortable wearing. Whatever type of safety gear you select, consider purchasing several pairs. By having multiple sets spread across your machinery, you are more likely to remember to use them. Whenever possible, try to go from a noisy environment to a quiet zone to give your ears a rest. The harsh reality is that the hearing loss from the persistent noises that come with the job, is irreversible. Not even hearing aids or surgery can make up for the loss; however, that doesn’t mean you cannot slow down the progression. 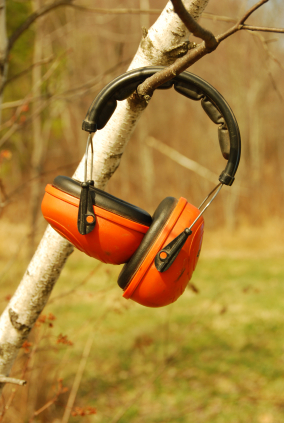 It is vital that you wear protective hearing gear at all times, your hearing should not be taken for granted.